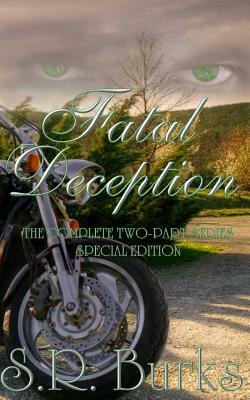 Fatal Deception Parts I & II combined in a special two-part paperback edition Relive every heart-pounding moment with the complete series, start to finish. For the first time, Fatal Deception is brought to you in paperback format. Now you can have all the suspense, heartache, love, and devotion of the Caldwell family, not just in e-book form, but in a high-quality paperback you will cherish for years to come. Inside: Fatal Deception: Part IMarc Caldwell raised his daughter on a country ranch with the help of his brother and sister-in-law. Retired young, he has devoted his life to his daughter, but she will soon leave for college. His brother thinks he should make plans for the future, but suddenly more serious concerns befall the family. Two new women have entered Marc's life: a blue-eyed, short-tempered journalist, and a beautiful new neighbor with soft mocha skin and delicate features that mimic those of his beloved late wife. Both women have secrets... but one is out for murder.Fatal Deception: Part IIIn the heart-pounding conclusion to the two-part series, Fatal Deception, shocking truths are revealed, betrayals exposed. Secrets, drama, deceit... Love, hope, passion... and ultimately fatal deception. -Interracial BWWM romance, Family bonds, Suspense.